Transforming conflict through social and economic development examines lessons learned from the Northern Ireland and Border Counties conflict transformation process through social and economic development and their consequent impacts and implications for practice and policymaking, with a range of functional recommendations produced for other regions emerging from and seeking to transform violent conflict. It provides, for the first time, a comprehensive assessment of the region's transformation activity, largely amongst grassroots actors, enabled by a number of specific funding programmes, namely the International Fund for Ireland, Peace I, II and III and INTERREG I, II and IIIA. These programmes have been responsible for a huge increase in grassroots practice which to date has attracted virtually no academic analysis; this book seeks to fill this gap. 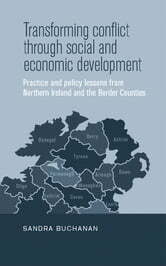 In focusing on the politics of the socioeconomic activities that underpinned the elite negotiations of the peace process, key theoretical transformation concepts are firstly explored, followed by an examination of the social and economic context of Northern Ireland and the border counties. The three programmes and their impacts are then assessed before considering what policy lessons can be learned and what recommendations can be made for practice. This is underpinned by a range of semi-structured interviews and the author's own experience as a project promoter through these programmes in the border counties for more than a decade. The book will be essential reading for students, practitioners and policymakers in the fields of peace and conflict studies, conflict transformation, peacebuilding, post-agreement reconstruction and the political economy of conflict and those interested in contemporary developments in the Northern Ireland peace process.